Nintendo’s catalogue of heroes is as long as it is varied. From plumbers in red hats and gorillas and monkeys in ties and caps to angels flying through the air and Inklings shooting coloured ink everywhere. Every new addition to the line-up is as unexpected as the rhyme I just managed to pull off. Of all the characters, however, none are quite as cute as Kirby and just like Nintendo’s headlining mascot, he too has not only mastered the platformer but also ventured into many other genres too. Kirby Battle Royale, as you might imagine from the title, takes the form of a 3D (sometimes restricting movement to a 2D plane) brawler with sprinklings of objective-based ideas thrown in for good measure. Whether you’re stacking apples, collecting fuel, or avoiding giant hockey pucks though, the core still falls back on the basic concept of running and jumping about while attacking your enemies. Fighters are basically Kirby in his various forms seen in past games. Everything from old favourites like Sword and Cutter to more recent appearances like his Doctor persona pop up – each with their own unique attacks. The move list is kept short and simple with many bouts often amounting to little more than the same attacks used over and over. Every fighter feels just unique enough though that you’ll want to try them all out while unlockable outfits add a little visual flair to your Kirby. 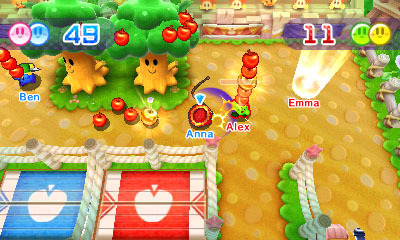 The game offers ten different mode types to tackle each with their own goal. Battle Arena is the most vanilla of the ten modes, pitting the four of you in a straight-up fistfight until one Kirby remains. There is the small catch that KO’d Kirbys can recover so you’ll need to knock everyone out simultaneously in order to claim the victory. It’s very simple stuff and with very few environments to battle in, you’ll grow tired of this mode quickly. Apple Scramble, meanwhile, sees you shaking apples from trees and depositing them through your team’s trapdoor using a lever. This mode is all about the teamwork and assigning who might be responsible for gathering fruit or just generally being a nuisance to the other team. Coin Clash, as the name might already give away, focuses on coin collecting whilst avoiding an enemy ghost. Gold can be picked up on the stage while battering your opponents will also rinse them of their change, too. Attack Riders is fairly similar where instead of coins you’re collecting poker chips. 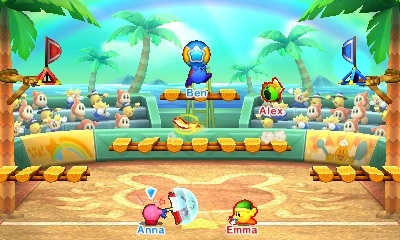 Restricted to a circular stage, players are able to hop into vehicles and race around mowing down opponents to steal more chips. Both modes are fun to play a couple of times but soon lose their appeal after extended sessions. Crazy Theatre is a neat idea that, unfortunately, suffers from a lack of variety. Players are faced with a series of mini-challenges that might have you figuring out a simple maths problem one minute and then trying to avoid falling meteorites the next. The unpredictability of it all certainly adds to the fun, however, a lack of tasks means you’ll see all this mode has to offer fairly quickly. Rocket Rumble is a real highlight having players try to gather as many fuel cubes as possible for their rocket ship. While you might focus on picking up the randomly spawned cubes, bombs can be stuck to rival rockets – their detonation sending more fuel cubes flying, too. 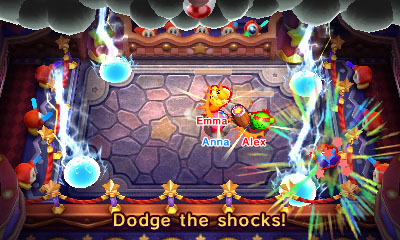 When ten seconds remain, players must dash back to their ship or risk being disqualified. These last moments make for some rather intense scuffles as you either play it safe and hop on board as soon as you can or try to stop others from making it to their rocket. Slam Hockey is another winner tossing a giant hockey puck amidst the battle with the aim, rather unsurprisingly, being to hit or throw the circular projectile at your opponents. Think of it as a game of air hockey meets dodgeball. Robo Bonkers is exactly that, with players competing to accumulate the most damage against a giant robot gorilla whether through firing rockets from cannons or unleashing your abilities. It’s one of the less memorable games of the bunch not helped by the cheap-feeling bonus awarded for landing the final hit. Ore Express, on the other hand, is a great addition taking place on a scrolling stage where you’ll then battle it out to grab and deposit as much ore as possible on passing trains. It has an almost Super Smash Bros. vibe, which is hardly a bad comparison. It’s just a shame there aren’t more stages to play on. The final game is Flagball, a contest that sees two teams trying to throw or slam a ball onto their respective flag located at the top of a 2D arena, which is a simple idea that can be fun when playing with human players. Surprisingly, the game does feature a Story Mode although the actual tale it tells runs extremely thin, even by Kirby standards. The little pink hero finds himself teaming with Bandana Waddle Dee in a tournament in order to win a giant cake. And there’s your setup for what is essentially five increasingly difficult leagues each throwing you into a mixture of battle types. While having an option specifically tailored for single-player may sound great, the experience is littered with some big problems. For one the difficulty is laughably easy for much of the first two or three leagues, my scores often eclipsing that of the nearest competitor. This made participating in these events feel like more of a chore, as I’d find myself quickly losing interest with no real challenge to keep me engaged. When the game did finally start to test me, I’d already seen the ten different modes numerous times already leaving me wanting to simply venture onto the multiplayer side of things. 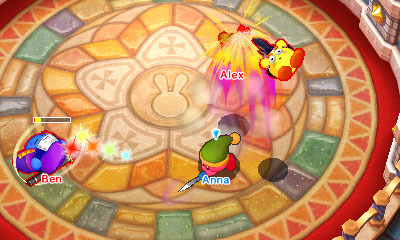 Predictably, Kirby Battle Royale fairs best when playing with others. While the game does include online options, it’s the local features that offer the best time. If you can somehow manage to find three others who own a copy of the game then every mode and option is available to play, even allowing you to create your own league with any mixture of the ten you want. Thankfully, the game does also offer Download Play, with the only restriction being that the ten modes get split into two packs of five meaning league customisation is a little more restricted. Even the mediocre modes have a little more life pumped into them thanks to the unpredictability and competitive nature of playing with people you know. Ultimately though, the lack of content in each of the ten modes means their appeal will eventually wear out even in multiplayer. Even a few extra stages or some adjustable modifiers to the rules of each would have helped keep the gameplay exciting. The Kirby series has been no stranger to interesting spin-off titles over the years but, unfortunately, Kirby Battle Royale is one of his weaker ventures. A batch of modes uneven in quality, fairly basic combat and a repetitive story option make for a pretty forgettable experience when played alone. With a group, however, Kirby Battle Royale can be a silly, fun time albeit a relatively shallow one.